Tosafist and controversialist; born at Meaux at the end of the twelfth century; died in Palestine in 1286. His French name was Sir Vives, and in rabbinical literature he is variously designated as Jehiel of Paris, Jehiel the Holy, Jehiel the Pious, and Jehiel the Elder. He was one of the most distinguished disciples of Judah Sir Leon, whom he succeeded, in 1224, as head of the Talmudical school of Paris. This school was attended under Jehiel's direction by three hundred disciples, among whom were the later renowned tosafists Isaac of Corbeil (Jehiel's son-in-law), Perez ben Elijah of Corbeil, Yaḳar of Chinon, Meïr of Rothenburg, and many other well-known rabbis of the thirteenth century. Jehiel was held in great esteem even by non-Jews; and, without giving any credence to the legends that present him as Saint Louis' councilor, it is quite probable that he was favorably received at court. Jehiel's position as chief of the Jewish community of Paris forced him into many controversies with Christians. Thus he once had to combat the arguments of the chancellor of Paris, who pretended to prove by the Bible that Jews are compelled by the demands of their ritual to use Christian blood. On another occasion he debated with a friar who, on the strength of a misunderstood Biblical text, maintained that Jews could not, consistently with their belief, bear witness in courts of justice. But these minor controversies were trivial in comparison with the disputation which, in the presence of Saint Louis and his court, he, together with two other rabbis, had to sustain in 1240 against the apostate Nicholas Donin, who denounced the Talmud as containing blasphemies against Christianity. The result of this controversy was, as was to be expected, the condemnation of the Talmud; but Jehiel displayed on that occasion great courage and dignity. At first he refused to enter into the discussion, alleging that the popes had assured independence to the Jews in their domestic affairs, and that the Talmud was the very essence of their lives. Then, being assured by the queen that the lives of the Jews were in no danger, he consented to answer any questions submitted to him, but positively refused to take an oath. After the controversy the state of the French Jews grew daily worse, and Jehiel had the mortification of seeing his son thrown into prison upon a baseless charge. He decided, therefore, together with his son to leave his native country for Palestine, where he stayed until his death. Jehiel was the author of tosafot on the Talmudical treatises Berakot, Shabbat, Pesaḥim, Mo'ed Ḳaṭan, Beẓah, Yebamot, Ketubot, Baba Ḳamma, Ḥullin, Zebaḥim, and probably Menaḥot; but these tosafot are no longer in existence. 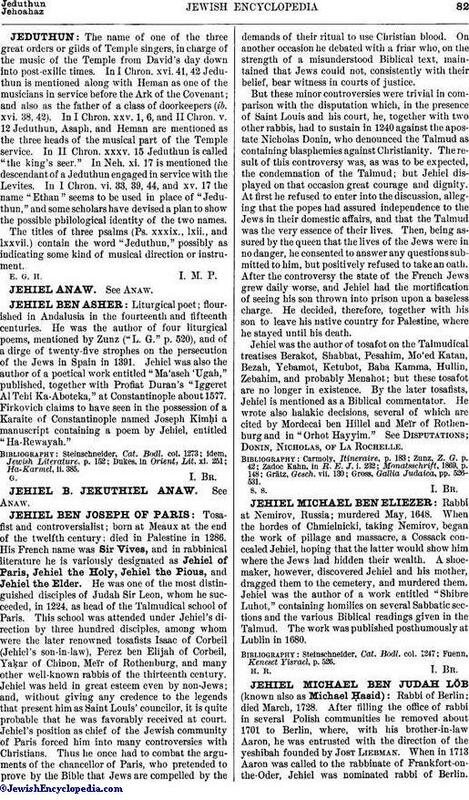 By the later tosafists, Jehiel is mentioned as a Biblical commentator. He wrote also halakic decisions, several of which are cited by Mordecai ben Hillel and Meïr of Rothenburg and in "Orḥot Ḥayyim." See Disputations; Donin, Nicholas, of La Rochelle. Gross, Gallia Judaica, pp. 526-531.